This leaflet aims to highlight important things to know when using aquatic herbicides. This is a quick reference to the most important issues when using aquatic herbicides. The recommended fact sheets listed later contain additional useful information. The Extension Service will only recommend herbicides that are labeled and have been tested and approved for safety and effectiveness. With a little understanding and care, using aquatic herbicides is safe. NREM – 101 “Are Herbicides Safe to Use in My Pond? First, correctly identify the problem plant to match it to an effective herbicide. Your Extension educator can help. Do not waste time, effort and money on the wrong treatment. Other factors in choosing a herbicide include cost, ease of application and withdrawal time: the number of days before a treated pond can be used for fishing, irrigation, livestock watering and other uses. The cost of a herbicide can be high – somewhere between $100 and $600 to treat an acre of plants. The cheapest is not always the best value. You must choose among herbicides based on effectiveness and cost. Problem plants come back unless underlying problems are corrected. Your county educator can help identify those underlying problems and some possible solutions. The heat of summer and early fall are riskier times to apply herbicides: when too much plant material dies at once, it may rapidly decompose, using up all the oxygen in the water. It is best to treat in sections or wait until spring. Treating only one-fourth of the problem area at a time is often advised. Note: in some cases this is not possible – the herbicide may be slow acting and intended for whole pond application only. Spring is normally the best time for herbicide applications. Harm to livestock and pets drinking from ponds. They often should be kept out for a recommended withdrawal time. People who fish or swim should also be kept out for a recommended withdrawal time. If you must apply herbicide from a boat, the work can involve more effort and care to get good, even coverage. Certain counties may have special use restrictions for herbicides. Contact the Oklahoma Department of Agriculture for information. 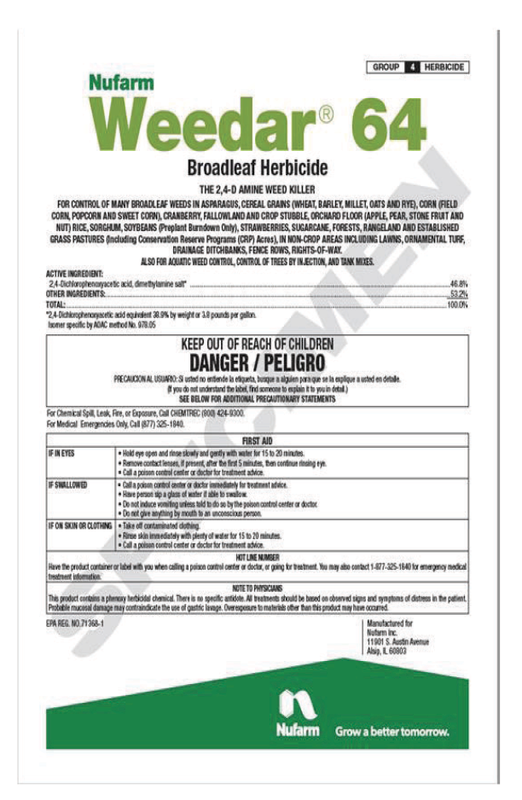 Before purchasing a herbicide, first read and understand the product label. The label is the law! Which type of site may be legally treated with the herbicide (ex: ponds and lakes, flowing waters, canals, reservoirs). How to use the herbicide. Which rates to use for specific plants and environmental situations. Precautions that should be taken, such as safety gear for handling, and requirements for worker protection. First aid in case of accident. Follow all label instructions. Ask for help if something is unclear. Understanding and following label directions protects your health and pocketbook against legal liability. Seek help from your county Extension agriculture educator as needed to understand label instructions and rate calculations. • Do not apply at more or less than the label rate. • Do not apply to flowing water situations without seeking approval from state and other regulatory agencies. If spraying, adjust nozzle for coarse droplet size and spray when it is not windy to avoid drift. • Fine droplets can be carried downwind. 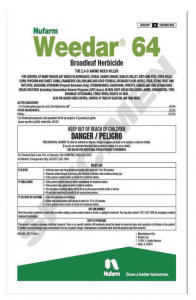 • The vapor from 2,4-D ester herbicide is a threat miles downwind – Read the label. Store unused herbicide in cool and dry conditions – or it will be damaged and ineffective when you try using it later. A list of licensed applicators is available from the Oklahoma Department of Agriculture. An aquatic applicator may or may not be available in your area. Aquatic dyes work to starve young submerged plants for light. They are preventative only. Dyes must be replenished several times each year and whenever there is a large pond overflow. Grass carp are effective against only certain soft plants and have several other drawbacks. CR-9202 Grass Carp for Pond Weed Management. Deepen shallow pond areas – most often these are pond edges that have shallowed out over time. Reduce nutrient runoff into ponds – especially phosphorus from fertilized lawns and fields and from animal manure.